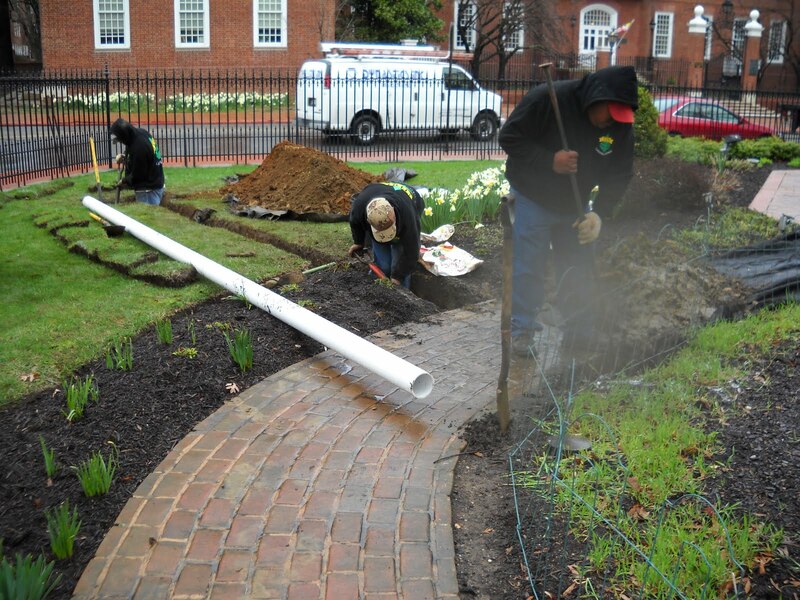 The General Assembly has ended for the year but the garden at Government House is just getting started. First on the agenda was solving a problem left over from last year. Sound familiar? Anyway, the problem facing us was that there was a low spot in the garden where water collected and made it incompatible for anything other than a frog. So how do you solve problems in Annapolis? Correct, you debate the issues. The fact that the water was a problem was undeniable. Those elected to analyze the situation came up with an obvious idea. How about installing bricks, rocks or even a bio-retention log at one end, build it up with soil and level it out? Good suggestions but Government House is an historic property in an historic city. How could one institute such a plan and retain the character of the property? A French drain. The turf was carefully removed from a section of the yard. An inconspicuous drain was installed at the edge of the garden and attached to a pipe. The pipe was placed under the sidewalk and continued to a collection box in the yard that was naturally lower than our problem area. The landscapers skillfully replaced the turf and were able to conceal the fact that any work had been done. Granted, this is probably not the best solution for most homeowners but it has worked perfectly so far in this situation. Coming next time: How about that cover crop we planted last year? ← I’ve planted "Self-Enclosing Trout"